Dailybuzz.ch: TV Producer In Beverly Hills For Pre-Emmys Event Arrested For Being Tall, Bald And Black!! TV Producer In Beverly Hills For Pre-Emmys Event Arrested For Being Tall, Bald And Black!! 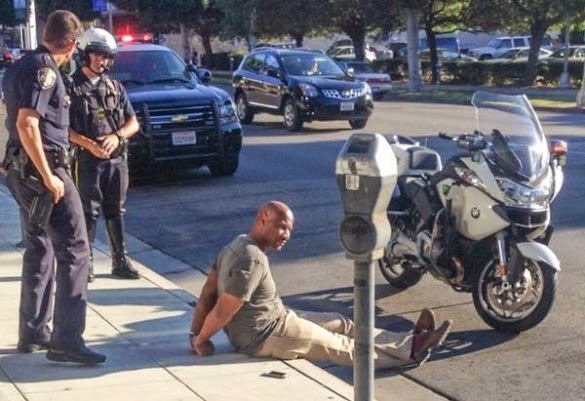 In yet another case of "walking while black," a film and TV producer recently told his tale of being held for six hours by Beverly Hills police while attending a pre-Emmys event because he looked like a burglary suspect. 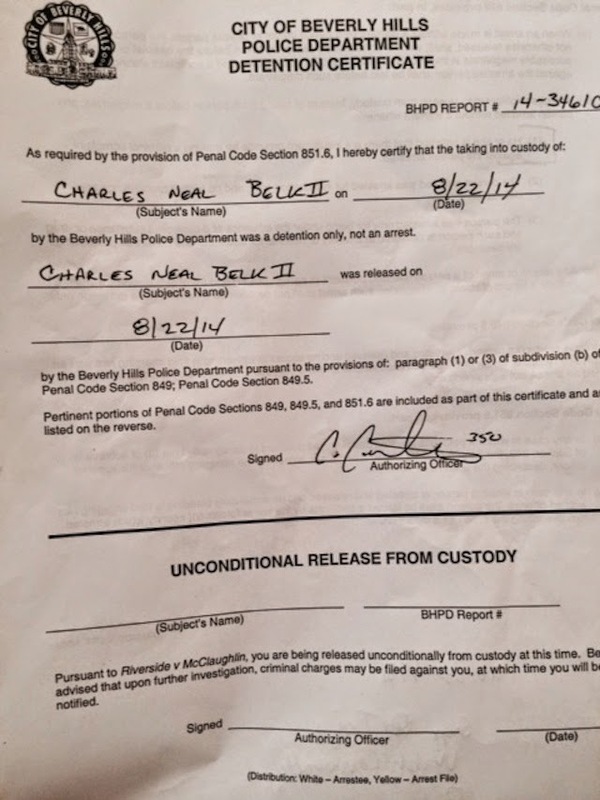 Charles Belk, 51, writes in a Facebook post that he was on his way to check his parking meter last Friday in Beverly Hills when he was detained. Earlier he had been handling celebrity talent at a Emmy Awards Gifting Suite, and he was planning on heading to a VIP Emmy pre-party later that night. He was walking from a restaurant on Wilshire Boulevard to his car, parked on La Cienega Boulevard at about 5:20 p.m. when it happened. He is grateful that he didn't look even more "suspicious" at the time, "In fact, if it wasn’t for a text message that I was responding to, I would have actually been running up LaCienega Blvd when the first Beverly Hills Police Officer approached me. Running!" He said he was surrounded by six police cars, then made to sit on the curb. He was handcuffed and searched, then transported to the Beverly Hills station. He was booked, accused taking part in the armed robbery at a Citibank location and couldn't leave without $100,000 bail. He said his car was impounded, he was denied a phone call and wasn't given a very good explanation as to why he was being held. What was he arrested for? Being a tall, bald, black man. I get that the Beverly Hills Police Department didn't know at the time that I was a law abiding citizen of the community and that in my 51 years of existence, had never been handcuffed or arrested for any reason. All they saw, was someone fitting the description. Doesn't matter if he's a "Taye Diggs BLACK", a "LL Cool J BLACK", or "a Drake BLACK"
Who is Charles Belk? He's a college educated business man, who received his Bachelor of Science in Electrical Engineering from the University of Southern California, then an MBA from Indiana University. He was a consultant for the NAACP, he worked on the 1996 Atlanta Olympics, has worked at IBM and has been on the board of numerous film festivals. Here's his IMDB. Among the long list of credentials he rattled off in his Facebook post, not one of them was "bank robber." What Belk says confuses him the most is why the footage from the bank was not reviewed until after multiple requests by Belk, six hours after he was detained and forced to sit on the curb. The footage showed that it was a different tall, bald, black man, and Belk was free to go.